These timeless bracelets are made in the traditional way in the Netherlands. The powerful designs are a mix of Italian leather combined with silver-plated elements. TERRA GENOVA black bracelet WIRED with silver plated clasp, made of Italian leather. 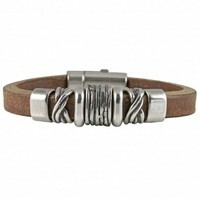 TERRA GENOVA black wrap bracelet with silver-plated hook closure, made of Italian leather.